The Fantastic Four: the first family of super heroes. They have seen quite a few changes in their decade spanning career: we saw Reed Richards, The Thing and Johnny Storm die at different times, we have seen replacements and fill in members on the roster, and we even saw the team change to the Future Foundation for a bit. But the heart of the book has always about family, and that’s exactly what you get with the Marvel NOW debut issue of the Fantastic Four. At the helm this time is Matt Fraction, who’s credits include the Immortal Iron Fist and Fear Itself among tons more. Fraction knows what people want when they pick up a Fantastic Four, and that’s a space spanning story focused on the original four. Mr. Fantastic, Invisible Woman, The Thing and the Human Torch: they are all here and in perfect form. This issue is a springboard for the whole book, as something has happened to the four, something that prompts Reed Richards to take his family, all of his family, into space in search of answers. Fraction nails each of the characters perfectly, as he sets the team off on a fantastic voyage (sorry, I couldn’t resist). Art wise, Marvel pulls no punches with the great Mark Bagley. Since his days on Amazing Spider-Man back in the 90’s, I have been a huge fan of the man’s artwork, and I couldn’t be happier to see him on such a flagship title. His art is so crisp, so clean, this is the kind of book he deserves to be on. All in all, I feel that the book is a perfect jumping on point, one that anyone can pick up and get ready to enjoy what’s to come. Not a whole lot of action here, but it sets the stage for what’s sure to be amazing. 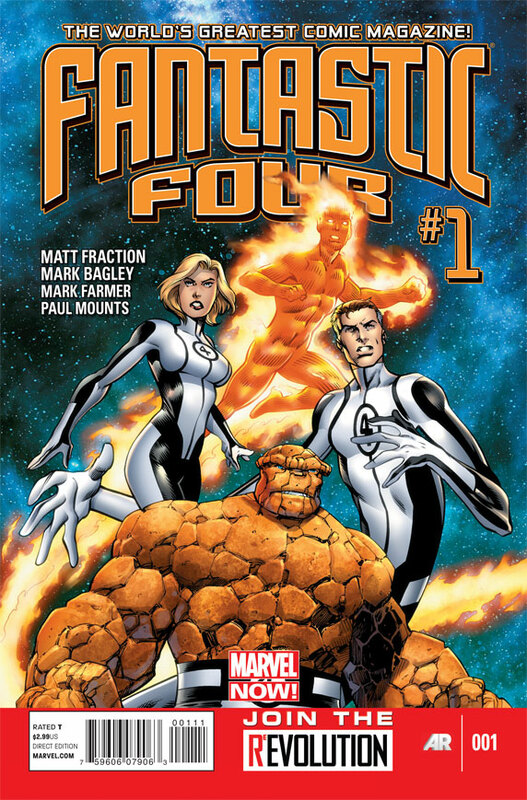 Highly recommended, I give Fantastic Four #1 a solid @@@@ out of FIVE.